For people in Illawarra, South Coast, Snowy Mountains and parts of Southern Tablelands, South West Slopes and Australian Capital Territory Forecast Districts. Issued at 11:03 am Friday, 14 September 2018. STRONG COLD FRONT BRINGS VIGOROUS WINDS TO NEW SOUTH WALES ON SATURDAY. Weather Situation: A strong cold front will cross New South Wales on Saturday, bringing windy conditions to most of the state. 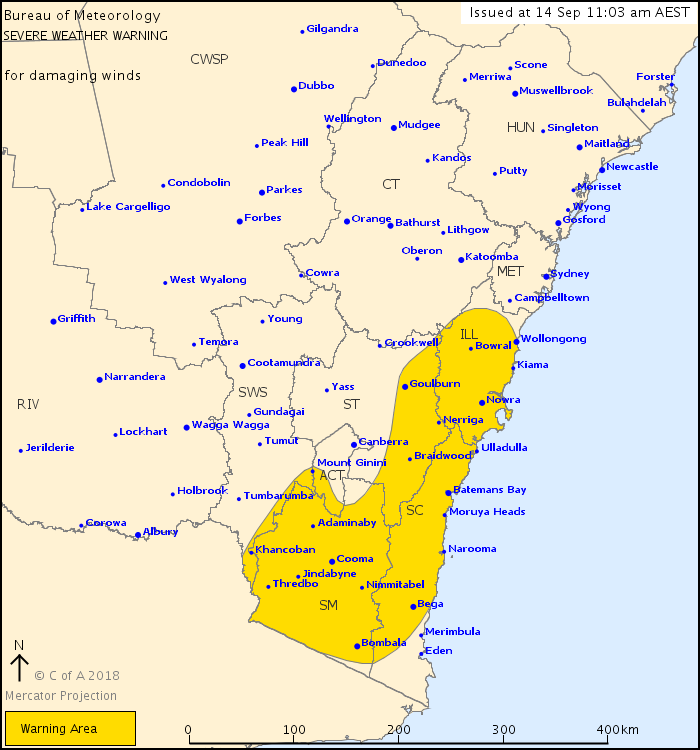 The strongest winds are expected about parts of southeast New South Wales. DAMAGING WINDS, averaging 80 to 90 km/h with peak gusts in excess of 120 km/h are possible from early Saturday about the Alpine Peaks. DAMAGING WINDS, averaging 60 to 70 km/h with peak gusts in excess of 90 km/h are possible from mid-morning Saturday for the Snowy Mountains, Illawarra and parts of the Southern Tablelands, South Coast and Australian Capital Territory. Elevated areas are most susceptible. Winds are expected to gradually ease on Saturday night. Locations which may be affected include Thredbo, Wollongong, Nowra, Bowral, Batemans Bay, Bega, Moruya Heads, Goulburn, Cooma and Bombala. * Move vehicles under cover or away from trees. * For emergency help in floods and storms, ring your local SES Unit on 132 500.